The Tokyo Gate Bridge was completed last year on February 12, 2012. It had taken several years for this bridge to be built and I had a good view of it being built. It was several years ago, during the early stages of construction of the Tokyo Gate Bridge, that I discovered a little park and barbecue area called Wakasu when I was trying to book a place for a barbecue with my friends; I got lucky and found a spot at Wakasu. At that time, the Tokyo Gate Bridge was under the early stages of construction with only the supports being complete and little else. The main span was starting to be built and that’s about it. It was a big open area with not much to see or do, except enjoy the park, have a barbecue, or go fishing. Today, the bridge itself towers over the area of Wakasu and tourism to the area has increased a lot as people learn about this old secret of Tokyo. The Tokyo Gate Bridge can look a little gaudy at times due to its shape. It is often called a dinosaur based on its shape but I prefer to call it a dragon. They had to design it with two major problems to consider. The first is that the bridge needed to be high enough to allow large ships to pass underneath as it spans a major shipping lane. 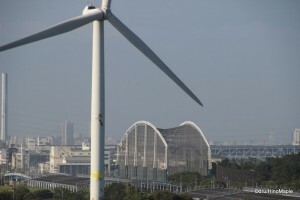 Then, they needed to make it low enough as it was on the flight path of planes heading to Haneda Airport. If the bridge was too tall, the planes would have to be rerouted and that would cause a headache for the airport. If the bridge was too low, the ships that were required to visit the local ports wouldn’t be able to pass underneath it. The bridge itself has somewhat of a steep slope but thankfully most of the hard work to climb to the central span of the bridge is done by elevator. The builders knew that tourism to the bridge itself could be high, so they built a special elevator to access the bridge deck. If you have ever visited Rainbow Bridge, the elevator has a few similarities to the elevator on the Shibaura side of Rainbow Bridge. If you plan to go to the Tokyo Gate Bridge late at night, you will probably be in for a bad surprise. The bridge deck is closed to pedestrians from 5pm, 8pm in the summer, and I would assume the security guards will make sure the bridge is cleared before it is closed. 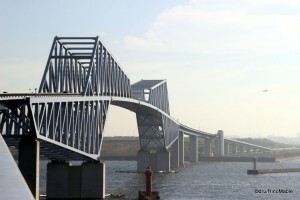 Rainbow Bridge is the same and I would suspect it is due to terrorist and vandalism fears. 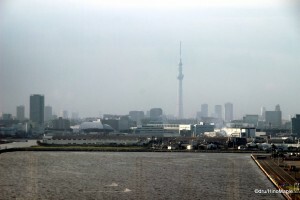 Looking at the location of Tokyo Gate Bridge, you may ask why it was built in the first place. Its main purpose is to act as a bypass for traffic so that they can avoid central Tokyo and alleviate some of the congestion on existing roads. Prior to the completion of the Tokyo Gate Bridge, the only way to get from Chiba to Yokohama, along the coast, was to travel through Odaiba. The highway was becoming congested with lots of trucks and the future needs of Tokyo were growing. The Tokyo Gate Bridge allows trucks heading to Yokohama to bypass that area and head south from Shin-Kiba and skim past Odaiba on a new manmade island before returning to the mainland next to Haneda Airport. The secondary purpose of the bypass is to help trucks get to and from Haneda Airport. This was planned due to the expansion of the airport itself. Haneda added a 4th runway in 2010 and had hoped for more cargo to be delivered to their airport. It hasn’t been as high as they would have liked but it definitely helped justify the building of the Tokyo Gate Bridge. From my own personal trip onto the bridge, I can say that the bridge is not needed on Sundays. I doubt that the bridge is useless as visiting on a Sunday and expecting to see a lot of large trucks transporting items to and from the airport is like expecting to see kids in school classrooms on Sunday; it isn’t going to happen. I wouldn’t mind checking out the bridge again in the future on a weekday but I don’t know if it would be safe. If you want to visit Tokyo Gate Bridge, the best way to get there is to go to Shin-Kiba Station. From there, there is a bus that heads to Wakasu Park and stops near the edge of the park where the elevator to the bridge deck is only a 5 minute walk. Alternatively, you can easily take a taxi and if you go with enough people, it is pretty quick and costs less than 1500 yen. Once you are there, you have a few options on things to see and do. The first thing you should do is head up onto the bridge deck and check out the view. Then you can head over to a popular fishing spot just below the bridge. If you don’t enjoy fishing, you can easily walk back to Shin-Kiba Station. Wakasu Park is on the way to Shin-Kiba Station and it’s a nice park with a large windmill with Astroboy on the side. The park also has a big play area for kids, a place where you can rent bicycles so you can explore the entire Wakasu area and a small cycling area for kids with their own animal themed cycles. If you have no plans to have a barbecue, you can easily enjoy a day in the park and work on your tan at the same time. The trip to the bridge is not really necessary but the views are pretty good. I went on a very hot sunny day which meant that I was sweating profusely. The walkway is still pretty clean after a year and a half of use and the walkway is pretty wide. 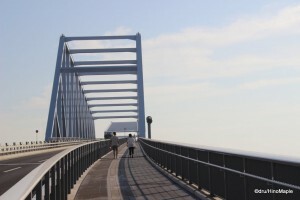 You can easily enjoy a nice walk in the sun, take photos of Tokyo, and enjoy the architecture that is Tokyo Gate Bridge. 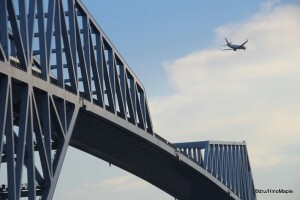 While most bridges are not that interesting, Tokyo Gate Bridge adds a little interest with the fact that you can enjoy good views of Tokyo as well as doing a little plane spotting with all of the planes heading to Haneda. Be sure to check it out if you are in the area, but I don’t think I would recommend a visit if you only want to see the bridge. It is a little hard to get there and if you aren’t interested in the other activities in the area, it may not be worth it. If you combine a trip to the bridge with a game of golf at the neighbouring golf course; with a barbecue; or just as a trip to go fishing, it is worth a trip to see the bridge at the same time. This entry was posted in Tokyo and tagged Astroboy, Chiba, dinosaur bridge, Gate Bridge, Haneda, Haneda Airport, japan, Odaiba, Plane, Rainbow Bridge, Shin Kiba, Shin Kiba Station, tokyo, Tokyo Gate Bridge, Tokyo Sky Tree, Tokyo Skytree, Wakasu, Wakasu Park, Yokohama by Dru. Bookmark the permalink. How about visiting the bridge and doing a bit of running? Worth it? or meh? Probably Meh. You can’t go all the way across. But if you think you’d want to, it isn’t terrible to go there.